What is the difference between a Mule & a Donkey? 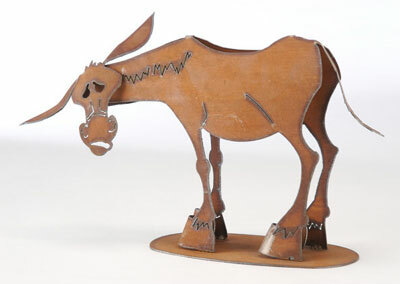 Mule or Donkey...if it's a Henry Dupere rusted metal garden sculpture, it's a cool Mule. A mule is the offspring of a male donkey & a female horse. Mule aficionados claim they are "more sure-footed, more patient, & longer-lived than horses." The mule is also considered to be less obstinate, faster, & more intelligent than the donkey. The mule shares the characteristics of a donkey, however the mule has superiority with its apparent additional endurance & is comparatively stronger than a horse of similar size. The donkey is a domesticated member of the horse family. A mule does not sound exactly like a horse or a donkey. A mule makes a sound similar to that of a donkey, but also has the whinnying characteristics of a horse, often ending with a hee-haw. Today, the mule is still used extensively worldwide to transport cargo in rugged & rural regions! A full-time artist living in Arizona, Henry Dupere is a skilled & passionate metal sculptor. His imagination, sense of humor, & love of nature are expressed in his unique metal garden sculptures! All of the garden art sculptures in the Dupere can be used to add a touch of distinction to any garden or home decor. Henry Dupere Mule / Donkey Garden Sculpture. 12" tall by 15 1/2" long by 7" wide. Three dimensional rusted metal garden sculpture. Hand-crafted & made in the U.S.A.!! !